Dental sealants are a great preventive treatment that can help keep growing teeth healthy and cavity-free as your child learns how to brush and floss properly! Dr. Danielle will apply this tough plastic material over the chewing surfaces of back teeth that are difficult to reach; once in place, they’ll block out food particles and decay-causing bacteria that try to gather there. 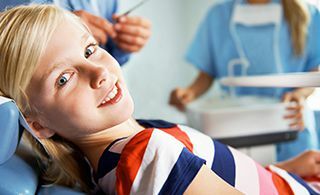 The treatment process is fast, comfortable, and completely safe for your son or daughter, and the teeth we cover can be used and cleaned just like normal. Depending on each patient’s unique needs, we may recommend dental sealants for both baby and permanent teeth. At Pediatric Dentistry of Prospect, helping children feel confident about their healthy smiles is what we strive for! New patients from Green Spring, KY and other nearby areas are always welcomed at our Prospect office – contact us today to schedule a first visit with Dr. Danielle and the rest of our friendly, welcoming team.